Thanks for your interest in volunteering for the road rally and classic car tour. There are lots of interesting volunteer opportunities both at the event and during the planning stages. If you are interested in working on the actual running of the road rally, you can volunteer to work on event planning or you can work along the route on Rally day. There are several different types of teams that are used during the running of the event. If you would like to help on the production of the event there are all sorts of errand and clerical jobs that are done during September and the schedule is flexible. On Rally weekend there are several different areas where you can help. We have a registration table, sales table, cocktail buffet on Friday, and breakfast, lunch, and the awards party on Saturday. And, of course, Sunday morning clean up. We sometimes need people who are interested in actually participating in the rally or the tour. Often people have cars that they would like to drive in an event but they have no one to accompany them as a navigator. 4th of July parade in Southampton Village. 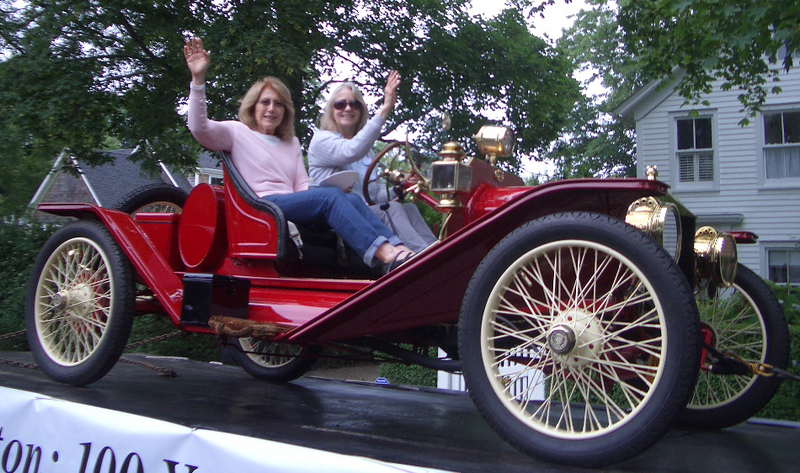 Behind the wheel is Cathie Gandel with her friend Jean Demmer as passenger.